Writing rookies are mixing it up with Scottish crime royalty and the 'defending champion' among a fascinating twelve-book longlist revealed today for the 2017 McIlvanney Prize. Thirty years ago, Ian Rankin introduced the world to Detective John Rebus in Knots & Crosses, and Val McDermid published her first crime novel, Report for Murder. It would take several years before the wider reading community started to catch on to the brilliance of these two Scottish authors, but nowadays thanks to them and the authors who've followed, Tartan Noir is held in very high regard. The ongoing strength of the Scottish take on the genre is on show today, with the release of the longlist for the 2017 McIlvanney Prize, formerly known as the Scottish Crime Book of the Year Award (last year the annual prize was renamed after the man, William McIlvanney, who Rankin, McDermid and many others credit with establishing the tradition of Scottish detective fiction). 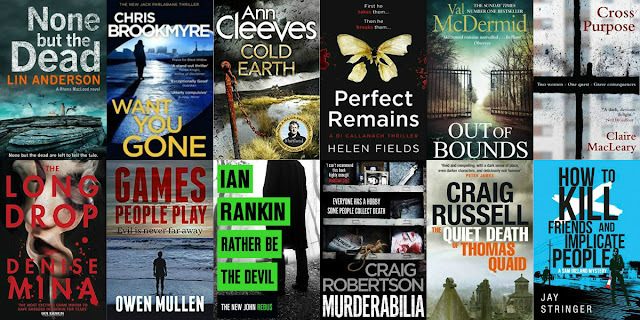 Fittingly, Rankin and McDermid are joined on this year's longlist by a diverse collection of crime compatriots, ranging from the winners of the past two prizes, Christopher Brookmyre and Craig Russell, and CWA Dagger longlisted Denise Mina (The Long Drop), to debutant authors Claire MacLeary, Helen Fields, and Owen Mullen. "In what is shaping up to be a record-breaking year at Bloody Scotland (we sold twice as many tickets on our first day as last year), I’m pleased to see so many of the highlights of the 2017 programme featured on this longlist," said Bloody Scotland director Bob McDevitt. "It’s also brilliant to see a few debut novels on there slugging it out with the more established names. I certainly don’t envy our judges the task of picking a winner from this excellent crop of crime novels." The longlist was chosen by an independent panel of readers and features books from both small Scottish publishers and large multinationals. The longlist will be judged by Granite Noir programmer Lee Randall, comedian and crime fan Susan Calman, and New Zealand journalist Craig Sisterson. A shortlist will be announced in the lead-up to the Bloody Scotland festival. The winner will receive £1,000 and nationwide promotion in Waterstones, and will be announced at the opening reception at Stirling Castle on 8th September, followed by a torchlight procession - open to the public - led by longlisted author Ian Rankin.